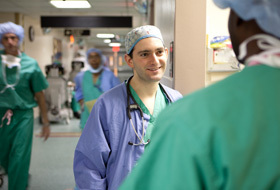 The Residency Program in the Department of Anesthesiology at Montefiore, the University Hospital for Albert Einstein College of Medicine, offers a breadth of clinical rotations in cardiothoracic anesthesia, neuroanesthesia, pediatric anesthesia, obstetric anesthesia, critical care and pain management subspecialties. 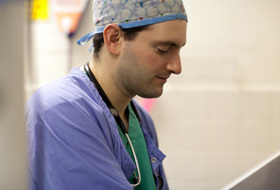 Residents are mentored by physicians who are internationally and nationally recognized for their innovation and clinical excellence, and residents are trained to use some of the most advanced technologies and medical techniques available.Residents receive a comprehensive education and experience in handling a wide variety of subspecialty cases. By the time they have completed their rotations, residents will be extremely well trained and prepared for an academic or private practice. Many of our residents are engaged in research, both clinical trials and project-based research, with the help of a dedicated research coordinator to advise on study protocols and Institutional Review Board (IRB) guidelines for human subject research. Though Montefiore's residency program is large, it is also personal. Our faculty are excellent teachers, and residents can choose a mentor to guide them in their education. The atmosphere is supportive and fosters professional relationships that will prove invaluable throughout residents' careers.